InformedBoater Academy will be sailing the British Virgin Islands Feb 18 to Mar 20, 2020. We have one boat booked for 3 weeks and a second boat on hold. This is your chance to take the instructional sailing vacation of your dreams. For more details, contact Rob MacLeod. Is this the year you head south? Head south with us! Rob MacLeod and InformedBoater Academy have been taking sailors (new and experienced) to the islands since 1983. This year we are going back to the British Virgin Islands for 3 weeks of instructional sailing. We have a 40-foot, 3-cabin sailboat reserved. 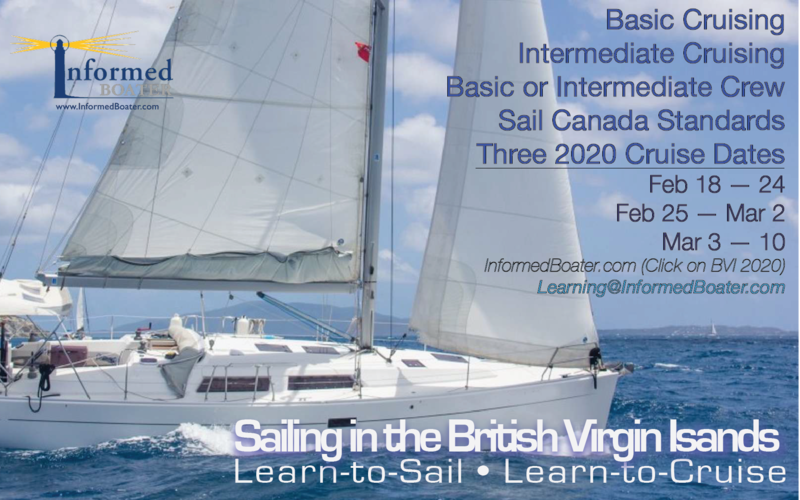 Download the 2020 BVI Registration.pdf for complete details including pricing. If you have questions email Rob MacLeod. Check out this video from the BVI Tourist Board.